The Bronx River Art Center (BRAC) and the New York City Department of Transportation (DOT), through its Urban Art Program’s Arterventions initiative, are pleased to unveil a new, temporary public art sculpture by New York City-based artist Xavier Figueroa in collaboration with the Emolior Academy Middle School. 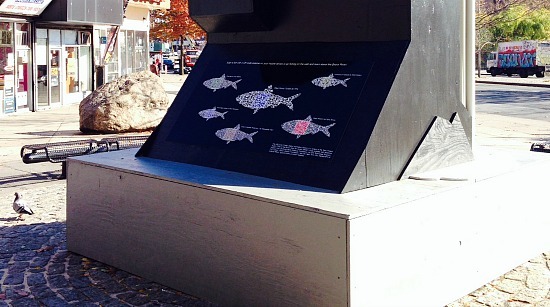 Xavier’s sculpture, Aqua Hung will be on view for several months at the center of West Farms Square Plaza—located at the base of the West Farms Square/East Tremont Avenue subway station on the corner of East Tremont Avenue and Boston Road in the Bronx, and one block away from the Bronx River Art Center. This partnership between BRAC and DOT echoes the agency’s commitment to enhancing the public realm, creating world-class public spaces, and strengthening community partnerships. The sculpture’s location was previously identified by the Urban Art Program as a priority site for temporary public art due to its proximity to mass transit and the areas commercial corridor as well as the support from the local community for beautification initiatives. Through a Deutsche Bank Americas Foundation’s Arts & Enterprise Place-Based Revitalization Grant, BRAC launched the West Farms Square Renewal Committee—a consortium of local businesses and organizations to renew the public spaces that make up West Farms Square. Inspired by the East 182nd Street Dam on the Bronx River, Xavier Figueroa designed this sculpture evoking a rocky formation with cascading water. The artist collaborated with Emolior Academy scholars from the Bronx River Art Center's afterschool program, who represented animals including a North American Beaver, American Eel, Snowy White Egret and the migratory Alewife Herring which pays tribute to the new fish passageway being constructed at the dam, in anticipation of its return to the river after a 350-year absence. XAVIER FIGUEROA was born and raised in Bronx, New York and received his BFA in Sculpture with departmental honors from CUNY Lehman College. With a background in carpentry, graffiti and fine art, Figueroa creates installations, paintings, sculptures and other various media that directly responds to its environment and utilizes his memories as a means to create multi-layered work which he refers to as "experiences." The craftsmanship and materials in his work challenge the viewers' perception both physically and mentally leaving them on the cusp of reality and illusion. He has exhibited in Longwood Art Gallery, Bronx Art Space, Salem Art Works, Cork Gallery Lincoln Center, Taller Boricua Gallery, Wave Hill’s Glyndor Gallery and Bronx Museum of the Arts. He lives and works in the Bronx. The Bronx River Art Center (BRAC) is a culturally diverse, multi-arts, non-profit organization that provides a forum for community, artists and youth to transform creativity into vision. Our Education, Exhibitions, Artist Studios, and Presenting programs cultivate leadership in an urban environment and stewardship of our natural resource—the Bronx River. This project is made possible with support from the NYC Department of Transportation and with support from the Department of Youth and Community Development. Special thanks to Emolior Academy scholars Diamond Acevedo, Abdoula Barry, Darwin Colon, Jailynn Garcia, Juan Latore, Rebecka Vividor, and the Bronx River Alliance.